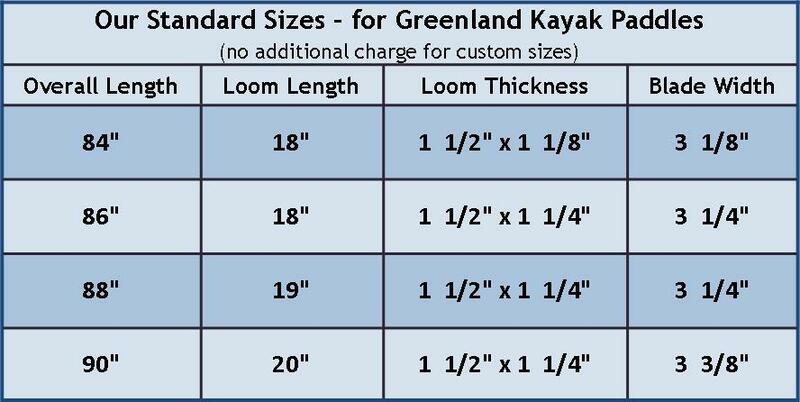 NorthPoint Paddles - Greenland Paddles: What Size? Measure your reach as you stand flat-footed and extend one arm above your head, measuring from the floor to the underside of the first knuckle of your middle finger - where your fingers would just curl over the top of the paddle. See “TAKE NOTE…” below for additional help. Measure the width of your shoulders when your arms are at your side, measuring at the widest point (to the outside of your upper arms at the shoulders). Then mark that measurement on a broom handle or something similar to a paddle, and then see if that distance feels comfortable to hold - you want it to feel natural to hold your arms apart at that distance, with elbows not too close to your body and not too far away. Another method: Stand with arms relaxed & elbows at your side, then bend your arms at the elbows to a 90 degree angle so that they are perpendicular to your body. Now, position your hands as if they were gripping a paddle, forming an ‘O’ with your thumb and index finger. Measure the distance from index finger to index finger on each hand. This is the approx. loom length. Form an ‘O’ (more like an oval) with your thumb and index finger, touching the tips of your index finger and thumb together. Measure both the width and height of the oval. The loom width is the longer measurement, and the loom height is the shorter measurement. Form a ‘C’ with your thumb and first finger; as tall as you can make it comfortably. The goal is to be able to grip the blade comfortably and securely with one hand, at the widest part of the blade - especially while rolling and bracing. Measure the height of the opening between the second knuckle of the index finger and base of the thumb. The above method for determining the overall length measurement is just a starting point—it is not an absolute, especially if someone is short or tall. An average height person—this method can work fine - even another inch or two longer is not a bad thing. A shorter person who measures less than 82" for the overall length of the paddle—should add 2” to 4" to the overall length. 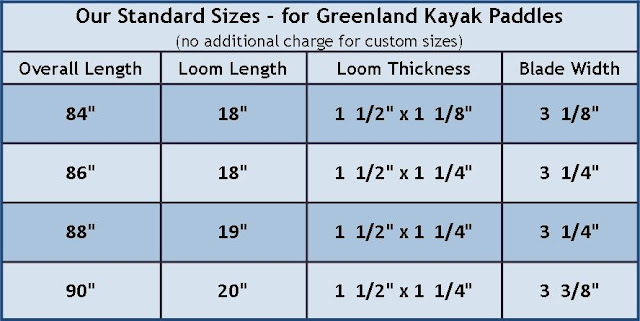 We do not recommend going shorter than 82" because you will then tend to use a sliding stroke to paddle - like when using a Greenland storm paddle. A really tall person—we usually subtract from the overall length, because if the paddle is too long, it will cause a lot of drag, defeating the "less fatigue" factor when using a Greenland paddle. We usually do not go longer than 92" in length. It is not uncommon to go with a longer paddle, especially for touring or if you have a wider kayak.